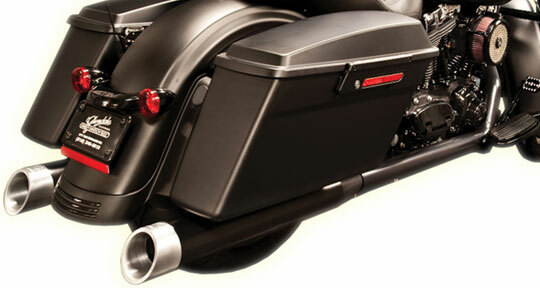 These new high performance True Dual exhausts for 1995-2013 baggers are tuned for high performance. Over a year of extensive research and development went into this exhaust system and MGS is stating an average increase of 12+ foot pounds of torque on a stock FL Harley-Davidson model. Better results have been achieved, but are not ordinary. These new True Duals are available in black ceramic or chrome with your choice of three different tip designs. MGS designed them so that ONE part number will fit ALL 95-2013 Harley-Davidson FL touring models. MGS Custom Bikes http://www.MGSCustomBikes.com 661-750-2424.